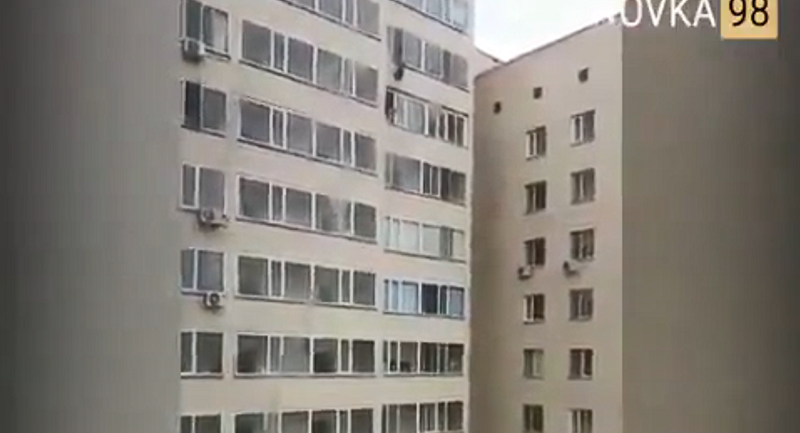 Video footage has emerged Tuesday of a man in Kazakhstan’s capital city of Astana saving a boy at the last second, grabbing him as he fell from a 10th story window. When a seven-year-old boy found himself on the wrong side of a 10th floor apartment window on September 24, 28-year-old neighbor Artem Yarev answered the call to heroics. "I went out on the balcony, heard screams in the street, people ran. I opened the window, looked out… looked up and saw that there was a child hanging there. He fell down, fell already, and I caught him," Yarev told Kazakh news agency Tengri News. ​Karev had a few minutes before an ambulance arrived to talk with the boy, and he told the news site about how the situation came to be. "He says he was at home alone," Yarev conveyed. The boy told him his mother had closed the window when she left for about 15 minutes, and he was bored. After dressing up for a night on the town, complete with dress shoes, jacket and hat, the boy cut the screen with a knife and began to climb outside the window. That's when Yarev, who lives in the apartment below, spotted him and heard him cry for help. "I myself was in a state of shock. I got more comfortable and managed to save him in time," Yarev said. Someone from across the apartment complex filmed the dramatic moment of the fall and posted it on Instagram, noting the complex was located on Astana's Victory Avenue. The boy was taken to a hospital with his mother. The press service of the Kazakh Ministry of Emergency Situations told the publication "the child's condition is satisfactory," and he has gone home with his mother.